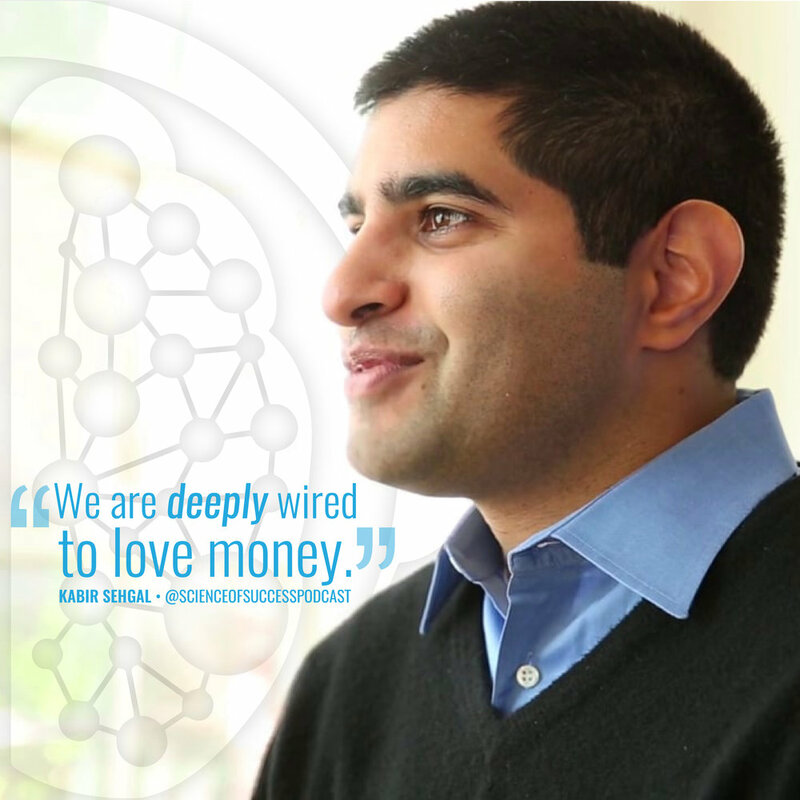 In this episode we discuss how you can create success by mashing two seemingly unrelated ideas together, why energy is the currency of the biological world (and how that impacts the evolution of money within our society), we go deep into understanding money and its role in our lives, and we look at why you should investigate your own biases about money with Kabir Sehgal. What does research show makes men more excited - dead bodies, naked women, or money? What does Genghis Khan have to do with the history of money? What are Native American potlatches and what do they tell us about tipping behavior? What is Soft Money, what is Hard Money, and what are the differences? Does the weather impact your financial decisions? What is the Soul of Money? Do Jesus and the Hindu scriptures offer the same financial advice? [00:00:12.4] MB: Welcome to The Science of Success. I’m your host, Matt Bodnar. I’m an entrepreneur and investor in Nashville, Tennessee and I’m obsessed with the mindset of success and the psychology of performance. I’ve read hundreds of books, conducted countless hours of research and study and I am going to take you on a journey into the human mind in what makes peak performance tick, with the focus on always having our discussion rooted in psychological research and scientific fact, not opinion. The science of success continues to grow with more with more than 875,000 downloads. Listeners in over 100 countries, hitting number one new noteworthy and more. I get listener comments and emails all the time asking me, “Matt, how do you organize and remember all this incredible information?” A lot of our listeners are curious about how I keep track of all the incredible knowledge you get from reading hundreds of books, interviewing amazing experts, listening to podcast, and more. Because of that, we created an epic resource just for you. A detailed guide called How to Organize and Remember Everything. You can get it completely free by texting the word “smarter” to the number 44222. Again, It’s a guide we created called How to Organize and Remember Everything. All you have to do to get it is to text the word “smarter” to the number 44222 or go to scienceofsuccess.co and put in your email. In our previous episode, we discussed the fundamental principles of GameTtheory, we correctly guess the answers to SAT questions without ever knowing what the questions were, we looked at how to use Game Theory in practical ways and went deep on how a college professor and his student started a beverage company, sold a billion bottles of tea and competed against Coke, Nestle, and other major players to become incredibly successful with our guest Barry Nalebuff. If you want to learn how to apply the lessons of Game Theory to being successful in your life, definitely listen to that episode. [0:02:25.7] MB: Today, we have another fascinating guest on the show, Kabir Sehgal, Kabir is a former Vice President in emerging market at JP Morgan. He’s a New York Times and Wall Street Journal bestselling author of the book Coined and has served as a speech writer for John Carry during his presidential campaign. He’s been featured on Fortune, the Harvard business review, many other publications. He’s also a regular contributor to CNBC as well as a Grammy winning, producer, composer, and jazz musician. Kabir, welcome to the science of success. [0:02:53.3] KS: Thank you so much for having me. Really a pleasure to be here. [0:02:56.2] MB: Well, we’re super excited to have you on today. For listeners who may not be familiar with you, kind of fill in some gaps in that background and tell us a little bit about yourself. [0:03:05.5] KS: You covered a lot of it. I guess I just find myself mostly as a writer and that’s writing words and writing music and creating content. For me, that’s taken me to write several books, you talked about my first book, Coined, history of money, but I’ve written about jazz and I’ve written I think up to seven books now. Children’s books as well. That’s one of my passions is writing and also, writing music. I’ve just finished writing my first musical opera on the financial debt crisis. So I try to be inter-disciplinary in my topics and also my approach but the one commonality is trying to express myself through the written, and spoken, and performed word. [0:03:50.4] MB: That’s fascinating, it kind of reminds me a little bit of, and I’m sure you’ve thought of the comparison but almost Hamilton-esque in the sense of like combining this two totally different mediums. But an opera about the financial crisis sounds really interesting. [0:04:02.9] KS: Yeah, you know, the thing is, when you want to create a real unique idea, you could have a lot of success by sort of mashing up two different disciplines together. If I were going to write an opera, I could write an opera today of things you’ve heard before. But why not take it in a completely new direction and you know, that’s why the opera in Nixon in China did so well because they took a story about Richard Nixon going to China and turning that into music. Something unexpected and so this idea, there’s like incremental ideas of like staying within one profession or one discipline and like incrementing the idea or improving a product five, 10%. When you take one discipline and mash it up with another discipline, you start to get all these different combinations that you didn’t think of before and it creates and it sort of amplifies possibility. You also create a new aesthetic, you create a new brand, you create a new way of looking at the world. It might seem weird, but it definitely gives you the many more permutations of invention and innovation. [0:05:10.6] MB: It’s fascinating, I love that advice and as somebody who has been so creative across seemingly kind of disparate, non-related fields, I think that’s some deep wisdom to share with our listeners, I love it. I’m curious, I’d love to kind of dig in a little bit and talk about some of the kind of the core concepts and lessons from Coined. [0:05:32.5] MB: One of the first things I’d love to kind of get your thoughts on, just really simply you know, I think people have a lot of preconceptions about this, but what is money? [0:05:41.2] KS: That’s a good question. The typical definition of money that comes from economic theory and economists is that money is three things. Money is a unit of value, it’s an instrument of exchange, and is used for counting things. Unit of value, instrument of exchange, and basically a way for counting a value and I have always found that to be sort of a very limiting definition of money. Yeah, if you define it, a unit of value is something that you count, a store value is something that captures money, an instrument of exchange, we transact. But money could be more than that thing. Money to me, and I define it in my book, is really a symbol of value. Because anything that represents value has sort of a neurological trigger in our brain and that means that a potato can function as money or some type of currency. If there is an invasion by aliens into the earth and there’s some kind of rare metal that they bring in and it becomes valuable, that new metal will take on monetary value. So anything that simulates sort of the reward circuitry of the brain, and we can get into that, that to me is what money is, a symbol of value and I think probably the economist and the most well described with Milton Friedman is, you know, whatever society determines should be money will be money. You can go back to caveman days or you can go today, whatever the people deem to be money will be money. So it’s very user defined and today, what is money? The definition of money of changing and it always will be changing because our minds are changing and, you know, our brains are plastic, the neurological wirings are changing. It will continue to change as use cases change. [0:07:23.9] MB: I definitely want to dig into kind of the psychology and some of the rewards circuitry around money but before we do, I’d love to — and I think this is a kind of a natural segue into that. Tell me a little bit about the phrase you talk about, “the biology of exchange” and how you kind of, in the book you start with the really kind of physical, biological components of it and even the journey you took to Galapagos islands and other things, I’d love to kind of weave that into how our brains think about money. [0:07:52.3] KS: Sure, well you know, I started writing this book with the history of money and you could think about, if you’re going to write a book on the history of money, where will you start? Most books will start in, I guess, Mesopotamia or the beginning of human civilization, sort of Neolithic era of 10,000 years ago or maybe even the great rift valley in Africa. I was like, “Money expresses something deeply survival based and evolutionary.” I started thinking about it and sure enough, I said, “I think there’s a biological component of why we use money.” In order to dramatize this point, I went to the Galapagos islands because that’s where Charles Darwin, that’s where he came up or was inspired to come up with this theory of natural selection, the evolution of my natural selection. So I get to the Galapagos, go and hang out with some friends who are marine biologist and what do we do? We go diving into the water and all of a sudden there’s this sea turtle that comes up to me and there are some wrasse fish, this little fish that are going up next to it’s fin and they’re cleaning the turtle, ingesting these parasites. What becomes clear is, this is an exchange going on. The turtle’s getting cleaned and in exchange, the fish are ingesting or getting the calories they need to survive, the parasites. This is obviously an example of symbiosis and the turtle and the fish is not the only example. This, of course throughout the Galapagos, different stages of the ecosystem, you see a symbiosis. You see transfers and the first type of currency, the natural currency, the currency of the biological world is energy. Energy, energy, energy. When this starts to get mapped on the history of humanity, you start to see the first types of currency is the first types of things that come traded as a currency or some kind of value is food products. So it’s been abstracted away because over thousands of years, but its original purpose, money was an instrument to acquire the needs to survive and there are genetic implications, there’s biological implications and a lot of supporting evidence from neuroscientist that show that there’s actually this energy concept is actually the evolutionary historians that are looking at, indeed, it wasn’t until the brain expanded and we got symbolic thought that money as we knew it was invented. But at its core, money is really an evolutionary product and that’s why I went to the Galapagos, to dramatized that accounts. [0:10:58.2] MB: After going to the Galapagos, where was the next place on your journey, the next destination that kind of follow the history of money? [0:11:06.2] KS: That’s a good question. I think for me, it was getting together with a neuroeconomist, because when I started realizing that there was a biological input, there’s input for money and why we use it, I wanted to talk to someone who knew about this. So I met with Dr. Brian Knutson at Stanford University who is one of our leading neuro economist, sort of like an emerging discipline of brains scientists that look at financial decisions. Largely through MRI and brain scans. Neuroscience is really sort of like, as they say, 90% neuroscience, 10% economics and hopefully that will change so more economist aren’t factoring in brain insights but you know, we talked about when I say the word money, like your audience, when it hears, when your audience listen to the word money, there may be an actual increase in the skin conductance, the electrical current going through your skin, just at the thought of making money or hearing the word money. So there’s a biological change, there is a study that shows that, well, if you take money and count it — in China, they did the study where people counting large denomination bills and then they took their fingers and put it in hot scolding water and the people that counted the money reported feeling less pain than the people they were counting blank pieces of paper and then putting their fingers in hot scolding water. This way, that money sort of dulls your senses. I went to Brian Knutson, this neuroscientist and we talked about, “Hey, is there a biological, neurological reason for this?” He says, "Absolutely there is, there’s a part of the brain called the nucleus accumbens and it’s deep within sort of evolutionary part of the brain, the limbic system of the brain and it fires incessantly at the thought of money. He’s done brain science studies and others have done studies that have proven this out, there is a study at Harvard that showed that people who were high on cocaine looking at their brain scan, their nucleus accumbens is firing incessantly. It looks the same as when someone’s about to make money. The brain scan of a coke addict and someone about to make money, the brain scans look almost indistinguishable. But Dr. Knutson then, he looked at heterosexual men and he showed them pictures of dead bodies and naked women and money. What got the most excitement out of men was thinking about making money more than getting together with a girl. It just shows you that we’re deeply wired for this thing, to make money, because you realize that we needed to survive. Because survival, you know, is prerequisite to reproduction. That was the next step of my journey was understanding the genetic components and having a neuroscientist and reading through the neuroscientific literature to realize, wow, there is actually hard wiring in the brain for money and things that function like money. [0:13:58.2] MB: Really interesting. The research studies are so intriguing, especially the one about the cocaine finding is fascinating. So I’m curious, what are some of the other kind of components of the psychology of money? [0:14:12.3] KS: Well, a lot of it comes to your genetic composition too. People don’t often think about it but you know, there is a group of studies called gene studies, twin studies that they take identical twins who have the same genotype, they have the same genes and they separate them over long periods of time and then they ask these twins to make an asset allocation decision. You want to put your money in stocks, bonds, or cash? They found that twins, even if they’ve been separated for a long period of time, identical twins that they invest and they part their money in similar proportions. That your genetics can in fact influence your financial spending decisions. Dr. Knutson and others, they’ve worked looking at your credit score actually and they found that there is one type of gene, it’s called the COMT gene and there’s two variants of it and it’s evenly dispersed within the population these two types of alleles. They find that if you have one variant, you’re more likely to be risk averse to put more money in bonds, in cash and to have kind of a decent credit score. If you have the other allele, you’re more likely to be risk seeking, put more money in stocks and higher performing assets but also risk your assets, and to have a lower credit score. They found that over time, among the sample that they were tracking that there’s one varying to the gene could explain about 97 points on your credit score and that’s about 20% of your credit score. It just shows you that, you know, when you’re making your financial decisions, that often times, it can be your genes and manifesting themselves, the decisions are being — what you’re buying is being manifested by genetic impulses. I tread carefully here because look, you can obviously try and thwart your genes, you’re not destined to be doomed by your genes and you can get educated and if you’re not very good in handling your money, you can definitely get classes and so forth. But there is something to be said that if you’re not good with money, you can maybe blame your parents and say you know, my parents made me do it because it’s their genepool after all. There’s definitely genetic reasons and impetus to how we spend. [0:16:31.5] MB: I’m curious, another concept that you talk about and I know is kind of one of the next steps on this understanding of money that you talk about in Coined is the idea of the anthropology of debt. I’d love for you to share that story. [0:16:44.0] KS: Sure, so most histories of money going back to Adam Smith and Aristotle, they say that money was invented through barter, right? We’ve all heard this that there is this land and someone had apples, another person had bananas and they were trying to trade with each other, so they decided to barter and then all this bartering started going on. Eventually money was invented out of this bartering, as a way to replace barter. That whole idea of bartering led to money has been with us in economic literature for thousands of years. If I know you, you’re part of my family, you’re part of my tribe or the neighboring society and we have a lingering relationship then let’s just do the transaction on debt. Like, you’ll owe me one. Okay. This whole idea of social debt is really one of the first and probably most ubiquitous currencies in the world, you think back to Neolithic times that if you’re a caveman and you catch some game and you bring it to the feeding station and you’re going to invite your friends because if you don’t invite your friends, the day will come when you’ll be hungry and then they’re not going to repay you. You won’t be repaid because you didn’t really offer to reciprocate or invite them. So think about this caveman, inviting you a feeding session, it’s basically like a forward derivatives contract today that, “Look, you’re going to owe me in the future at some time and I’m not sure what the value’s going to be but we’ll figure it out later.” That’s kind of what a forward derivative contract is when it’s traded on the market on Wall street today. When you look at the first types of currencies in the world, it’s actually not coins or paper. It’s, in ancient Mesopotamia, the record show that its loan documents, clay tablets that were denominating loan and silver and barley. Basically saying, “you owe this person X, you owe this person Y”. That’s the first type of sort of monetary instrument that gets invented as credit and debt. There was some great writers who talked about this that when you think about distance, you think about a mile as a measurement of distance, you think about an inch as a measurement of distance. Start thinking about money as a measurement of debt. Money is a measurement of a way to capture and understand how much debt is in the world because debt is the way, even today when you think about how our monitory system works with fractional reserve banking is basically we’re taking a one dollar or due credit multiplying it through our society into $99. When you ask about the anthropology of debt, it’s really re-equating ourselves with what money really is which is a measurement of debt. [0:19:53.0] MB: What’s the difference between currency and money? [0:19:57.9] KS: Well, currency, if you break it down, currency comes from a word “carer” in Italian which means like to flow and currency is, I like to say, a broader use of money. Anything can function as a currency, right? Like I was saying before, there’s different types of currency, there is social currency, there is financial currency, there is different types of monetary currency. I think that’s like if you're thinking about a scientific term, the mother genus, if you will, will be currency. Money tends to be a financial type of currency. The word money comes from the roman goddess Juno Moneta and who is the goddess that was sort of supposed to look after the treasury and after the gauls came in and sacked Rome or that treasury, Moneta means “to warn” in Italian. That name, over the many years has stuck money. To answer your question, currency is like a broader look at money and how I look at money through the book is really looking at currency throughout the world and money is definitely the financial child of the word currency. [0:21:08.6] MB: Tell us about your visit to Mongolia and why you went there? [0:21:14.7] KS: Mongolia is a fascinating place. I went there, again, to dramatize the history of money and because I was intrigued that paper money and a lot of monetary concepts that we think of is very western, really started in the east and the Mongolians get sort of a bad rap for Genghis Khan and he is a brutal dictator but they’re also parts of his empire, they’re quite modern. He went to the Southern Song dynasty and he fell that kingdom and he took over the Chinese empire, essentially. He realized right away that he needed to use something to unify his lands and he needed something to create a value throughout this land. So he issued paper money and paper money was initially backed by silk and I think essentially silk and silver. The great Marco Polo writes about Kubla Khan as the Khan prints money out of the barks of trees. Then, they started spending so much money, they started running out of silver and silk so Kubla Khan does something he decides to cut that link between money and metal and he issues these Edicts saying that, “If you do not use my money, you’ll be put to death, I will kill you.” He also issues Edicts that say essentially that, “If you counterfeit this money, I will also kill you.” You start to see that money is really backed by fear of the kingdom or the Khan in this case and force. So this money starts to circulate and throughout this part of China, throughout the Mongol empire, which was quite vast and over time, they started printing more of it, there was a monetary crisis which led to inflation and then an inflation turned into a full-fledged economic collapse. Then there was a plague and all this other healthcare problems, that part of the Mongol empire fell and now I went to Karakorum, Mongolia which is the seat of the ancient Mongol empire. There’s nothing there anymore except for some ruins and it just shows you that civilizations could come and go and one of the most important decisions that any civilization, any society can make is what will function as money but also making prudent financial decisions to make sure that they’re not living beyond their means. Because if you do, you could go the way of that part of the Mongol empire or any country that’s really fallen and disappear because of their economic misfortunes. [0:24:20.7] MB: Very interesting that the Mongols are essentially one of the creators of fiat currency. [0:24:26.5] KS: Right, yeah. A lot of people lay claim to it. Some people say the Tang dynasty in China, which was 9th century AD, they invented paper money but money didn’t really function and flourish until the Mongols. Then you have sort of the checking system that came about in the Munecian times. Money’s really been a global, an incremental innovation and almost every country has adapted it for their own use case and so many different things have functioned as money throughout thousands of years in human history. [0:24:57.7] MB: Another facet of the kind of anthropology of money, you talk about tipping and what tipping behavior can say about us, nut you also share the story of a Native American potlatch. I’d love to hear that story. [0:25:11.6] KS: A Native American potlatch is a practice when a tribe or a group of tribes will invite everyone to a ceremony and you hold a potlatch during a very special occasion. So let’s say there’s a new chief or a new king or a new queen or someone is getting married and the practice is you line up everyone and everyone sits in order according to their status and there’s singing and there’s dancing and there’s a lot of food and then at the end, there’s a gift giveaway and everyone starts getting gifts. So the king or the queen or the chief or whoever will start giving gifts to everyone who’s been invited and your gift, the type of gift and the expense of the gift is based on your status within the tribe. So if you get something amazing, if you get a nice piece of meat for example that means you’re respected. If you get something that is not so good, it might be that you’re too junior or you don’t have much respect and so a potlatch became a way of using currency or giving currency, giving something of value as a way to reinforce status within the community. So essentially they are big timing each other and so the potlatch became a very competitive thing and this has implications even to today but I should say that in Native American tribes, Native American community gifts are not something that you keep. Gifts are something that you keep on passing to other people and this term “Indian Giver” in the West Americans, we may see it as a negative thing. You know Louis and Clark when they did their travels across America, they would give gifts in their trade with Native Americans. But then the Native Americans would give the gifts that they had just received to other people or they would give the gift back to Louis and Clark and the early settlers and this was really bizarre. Why are they giving their gifts away? A gifts are meant to be appreciated. But in Native American communities, if you just hold onto a gift, it loses its spirit of being a gift. You have to keep on giving it and that giving and receiving defines social rules within the community and it’s something that we do. I saw some poll recently and around holiday season that a large sloth of Americans are embarrassed by saying and admitting that they are re-gifting something but a large sloth of Americans also do re-gift. So we all do it, a lot of us do it so that shows you what a potlatch is and how gifting is so endemic to the idea of money and how even today this idea of re-gifting helps define where you are in the social community. Not only in Native American communities but also in our day to day lives as well. [0:28:12.0] MB: Have you ever read the book Nonzero by Robert Wright? [0:28:15.6] KS: No. Tell me about it. [0:28:16.6] MB: I think you’d really like it. It’s a book about he essentially uses and combines Game Theory and social anthropology to describe the evolution of human societies and it’s a really, really good read and we’ll include it in the show notes as well for listeners who want to check it out. But he talks a little bit about potlatches and I think he even goes there were some tribes where the tradition became so extreme that they would burn all the gifts. It will be like who can burn more stuff as a demonstration of how wealthy they were and how powerful they were that they could torch copious amounts of food and supplies and all kinds of stuff. [0:28:52.8] KS: Wow, how perverse you know? It’s absurd but at the same time revelatory about what a society values and wants to express about itself. [0:29:02.7] MB: So what is the difference between the concept of soft money and the concept of hard money and what are both of those? [0:29:09.7] KS: Soft money I define as — Well, let me start over. I’ll stick a first pin looking at hard money. Hard money is money that’s backed by a commodity or a metal. We often think about gold as being a hard money that the gold standard that it used to be that the dollar or the pound was redeemable by some amount of gold currency, by some amount of gold that there is a special room somewhere that you go and exchange your money and get an adequate amount or an equal amount of hard currency. And so, I define hard money as just that, metal back to money and in some cases, you can call it proto money. Anything that has some sort of intrinsic worth like meat, or salt, or barley. All of these things like coffee beans, this things service having value to human that you can eat it, you can consume it, they are instantly valuable. These are different types of hard currencies. Soft money is the opposite of that, which is an article of faith, it’s paper. It’s basically saying this piece of paper is basically an IOU from the government and it’s not necessary an IOU for gold. In fact it’s really an IOU saying that this is a legal tender for all debts private and public and so people say that the US government military or the US government is the backing of the US dollar but it really is the faith in our institution, it’s the faith in our government that the dollar will be backed by our government to come to the rescue much like it did during the great financial crisis in 2008-2009. So increasingly we are in a soft money world and some people say we need to get back to a hard money world where there is the gold standard and so forth but I would say that getting back to a gold standard would be very deflationary for the economy. In fact Winston Churchill when he was the head of the ex-checker in Britain he said it was the worst mistake of his political life to try to get back to the gold standard in the same rate at which Britain left because there was a massive amount like 50% deflation in unemployment and millions are going out of work because they are trying to go back to this gold standard. Well one is interventionist and one is not and you probably don’t want to be a politician who’s looking like he’s not doing anything or being very hard lined and that’s why you always have this policy of interventionism and you always have this policy of spending of soft money and that’s why soft money is so ubiquitous in the world because it’s a silent tax on all of us that the government can rob us very slowly with the value of money. The dollar has lost 81% of it’s value on a purchasing price pair parity level over the last 30 or 40 years. Soft money is with us, it’s not going anywhere anytime soon and I think we are stuck with it. [0:32:41.6] MB: In many ways that is the modern version of what Kubla Khan began. [0:32:46.4] KS: Yeah, exactly. There is a history of money and I talk about it in my book that the history of political leaders that have sought to use soft money and every problem there had been consequences for that. Kubla Khan would be one, you could look at John Law in the early 1716 to 1720 in France, you could look at Benjamin Franklin who wanted more bank notes issued, Abraham Lincoln, these are all people that took us away from hard money. Franklin Roosevelt, Richard Nixon. So there’s many core leaders that have pushed us in the direction of soft money for thousands of years. [0:33:30.3] MB: The most interesting description or criticism of the gold standard that I have ever heard is the idea that essentially the expansion of credit in an economy that’s tied to the gold standard is not determined by for thought or economic policy. It’s solely determined by random fluctuation of rocks that are pulled from the ground. [0:33:50.6] KS: Right, I think Warren Buffet has a great line that we dig up metal from these holes in the ground and put them in other holes in the ground and into our vault so we can store them and any Martian looking at us will be like, “Why do you do this?” And so somewhere, you get back to the evolutionary thought. If somewhere the idea of shinny metals and values, those neurons fire together maybe it is something that attracted us, that maybe early primates were attracted to something that had shinny luster and that it was valuable because there’s very little use case for gold. Other than preventing fires, it’s a resistance but there is very little use case for gold other than ornamentation and it’s been short of a principle of value for us and it’s hard to explain why that happened other than we were just naturally attracted to it. [0:34:45.9] MB: Buffet also has a great criticism of gold as a “asset class” where he says, “If you had all the gold in the world, you can’t do anything with it,” right? Which is what you were saying but he compares it to an asset that’s actually income producing. Like if you had a factory, you can make things and sell them and it returns capital whereas gold just sits there. It doesn’t produce anything. It’s not a productive asset. It’s just a rock. [0:35:11.0] KS: Right, exactly. That’s what it is. He’s a wise man. [0:35:15.8] MB: He is a wise man. Changing gears, I’m curious you’ve talked about how does weather impact people’s financial behavior? [0:35:24.1] KS: So weather manifest itself and through a financial decisions. You can see it in stock market returns. Going back to 80 years ago, we have data on weather patterns. We also have data on stock market returns and so the researchers looked at trading patterns for the largest markets, New York, Tokyo, Hong Kong and London and they looked again at the data and they found that sure enough that on sunny days the markets performed and annualized 25% or something like that versus cloudy days which is like 12%. And so it shows you that one type of business barometer or market barometer is the weather and I had a client of mine and my clients manage billions of dollars and I never had a client say, “You know it could be the sun made me buy that stock.” But often times we’re not really aware of what is shaping our financial decisions and this can be found on a very micro level too. Ask any waiter, and you asked about tipping before, but ask any waiter and they will say that when you seat people outside on a sunny day versus a cloudy day or versus seeing them inside, when you seat them outside on a sunny day, people are in a better mood. People are in a better frame of mind and this study was replicated I think over a couple dozen cities and they found that waiters sure enough would get more money when they’re guest were seated outside on a sunny day. So again, there is genetics, there is biology, there is weather factors that shape our financial decisions even when you are not thinking about money, you’re thinking about money. [0:37:06.4] MB: In the book you talk about the soul of money. What does that mean? [0:37:10.6] KS: I think the way you use money can also may determine the fate of your soul, which is a loaded comment I know but that’s how if you are a believer in the scriptures whether it’s the tree Abraham religions or also to Hinduism, that’s what the scripture says. I went to Al Qaeda and I went to the home for the dying investiture and Mother Theresa and there I found a young teenage and he told me that he was there because of what the scripture teaches, the gospel teaches. When I was his age, I was focused on other things. I wasn’t focused on helping lepers and so I went back and read the scriptures and sure enough that the gospel is pretty clear. In the book of Mathew there are eight parables and in eight of the ten parables Jesus is talking about money or wealth, how to use money. He talks about money so often it always makes you feel uncomfortable. Jesus is always giving financial lessons of what to do with money and not to squander it and make sure that your valuing thing that are everlasting. Even on the Sermon on the Mount he says, “Lay up your treasures in heaven and not on earth,” and then he goes on to say something very precarious that people had been trying to work out for generations, theologians have been arguing about this. He says essentially, and I don’t want misquote Jesus but he says essentially that the eye of the body, do not darken the eye of your body and then he goes on to talk about money again. But in fact, there’s a pastor who talks about this who’s been hearing confessionals for 25 years. He says, “You know, I’ve never ever had someone come into the confessional and said, “Forgive me father I have sinned, I am too greedy.” He says, “It just doesn’t happen.” People aren’t concerned about how much money they have but Jesus is putting forward a test that if you want to follow me sell all of your possessions and follow me, detach from money and that’s not something we want to hear because it’s not practical. It’s very difficult. If we live according to the scriptures then how you use money at least can be a determinant on the fate of our souls and if we lived and how we use money can determine our character. So I ended my journey, and I wrote about this in my book, at a temple in India and learning about what Hinduism says about money and I thought the advice in Hinduism to be the most practical and nuanced out of the time I spend looking at religion and money. Because in Hinduism there is a few goals, that fighting four goals to life. One of the goals is called Artha, which means wealth. It is your job, it is your duty in life to make Artha, to make money because you’ve got to take care of your family, you’ve got to take care of your friends and people are going to look at you for that, Artha. But there’ll come a time in your life when you realize that chasing money and chasing status, you realize it will leave you a little empty inside and that’s when you prepare for the end goal of Hinduism, which is called Moksha or liberation. Which is, “Okay I have attained these things. I’ve done it ethically. I’ve got all of these resources. I’ve made money. I made a name for myself and now it’s time to detach from these things,” that is to correspond to periods of your life. So if you are young and you’re listening to this podcast and you’re trying to learn the tips of the Science of Success and try to succeed, that’s awesome. Do it, make Artha, make your money, make your status but as you get older 70’s, 80’s, 90’s and you start to think about leaving the world, you can start relinquishing these things and sart realizing that it’s okay to renounce these things and leave things to other people. This can also correspond to period every day which is in the morning you are making money. You are making a name so you decide to go into work but at night you detach from these things and it’s with finding some balance or some harmony in your life and it just shows you that it’s good to go out and make the money but also realize the Moksha or liberation from it’s also determination. It would also focus you on this idea of the soul of money meaning that how you use money arguably, again according to the Scriptures can determine the faith of your soul. [0:41:46.4] MB: So for listeners who want some practical actionable steps that they can take to implement some of these findings about money and the history of money, what are some ideas or strategies that you’d recommend for them or what’s maybe one piece, one simple piece of homework that you would give to them? [0:42:04.1] KS: That’s a good question, I think my book wasn’t so much about how to make money. It was about understanding money and its role in our lives and with your focus on psychology and the science of success, one of the probably easiest places to look if you are in biases and cognitive biases of how we use money, so there’s all kinds of biases. If you hadn’t read Daniel Kahneman’s work Thinking Fast and Slow, but a lot of people have documented these biases. One of them is called the availability bias that the more often you can think of something you start to inflate the probability of actually happening. A good case of this is my father, he plays the lottery every week and I say, “Okay why do you play the lottery every week?” He says, “Oh I see it on the news and I could win. I could be there holding that big check,” and I said, “Well you haven’t seen the millions of other people that lost,” and so he’s trying to get to inflate the probability of it actually happening. So I would say that if you are looking to try to get smarter or how you use money, start of thinking the biases that you live by. A practical one is if you hear about a stock idea or they hear about a new company you want to invest in, give it three months and let it cool off a little bit. That company is not going to go away. The stocks are still going to be there and because you are familiar with that information, you start to really get excited about it. You start to make an emotional decision. I would say start to institute time constraints. Anytime you hear about something you want to buy, put a month. Put two months before you actually buy it because them you are actually cool to the decision and if you still want to do it, then you’ll do it but you’ll be making such an emotional and perhaps irrational decision immediately. [0:43:42.4] MB: Where can listeners find you, your books, and your music online? [0:43:47.3] KS: You can find me at www.kabir.cc. [0:43:53.0] MB: Awesome. Well, we’ll make sure to include that in the show notes so that everybody can find the books and listen to some of your music and explore these topics more deeply. Well, Kabir thank you so much for being on the show. It’s been a fascinating conversation and we really appreciate having you on here. [0:44:10.1] KS: My pleasure, great to be with you. [0:44:12.0] MB: Thank you so much for listening to the Science of Success. Listeners like you are why we do this podcast. The emails and stories we receive from listeners around the globe bring us joy and fuel our mission to unleash human potential. I love hearing from listeners. If you want to reach out, share your story or just say hi, shoot me an email. My email is matt@scienceofsuccess.co. I’d love to hear from you and I read and respond to every single listener email. The greatest compliment you can give us is a referral to a friend either live or online. If you’ve enjoyed this episode, please, leave us an awesome review and subscribe on iTunes because that helps more and more people discover the Science of Success. I get a ton of listeners asking, “Matt how do you organize and remember all these information?” Because of that, we created an amazing free guide for all of our listeners and you can get it by texting the word “smarter” to the number 44222, or by going to scienceofsuccess.co and joining our email list. If you want to get all of this incredible information, links, transcripts, everything we just talked about, and much more, be sure to check out our show notes. You can get them at scienceofsuccess.co, just hit the show notes button at the top. Thanks again and we’ll see you on the next episode of the Science of Success.